Researchers have suggested that ELT materials should be created in a more systematic way. This presentation proposed a systematic creation process by introducing an Instructional Design model called ADDIE (Analyze, Design, Develop, Implement and Evaluate) and how it can be applied to the creation of ELT materials. References can be downloaded HERE. Making great teaching materials is not only about the content but also how it is presented. Research has shown that visual design influences both student comprehension and motivation. This workshop offered some visual design best practices to improve student learning, and demonstrated how they can be applied to materials using word processing software. I just got the official word: I will be a featured speaker at the Japan Association for Language Teaching’s 41st Annual International Conference on Language Teaching and Learning & Educational Materials Exhibition in Shizuoka. 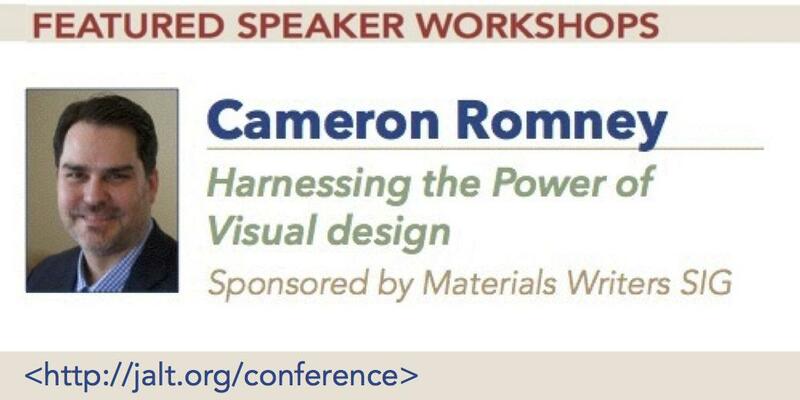 I will be giving a workshop called Harnessing the power of visual design and a lecture titled Towards systematic materials design with ADDIE. I’m really excited, especially that the conference will be at Granship in Shizuoka. The first JALT conference that I attended was held there in 2003. It’s a real milestone for my career. Twelve years ago I attended JALT as a participant, this year I will be a featured speaker. What a difference 12 years makes! I’m also really excited about the conference theme of “focus on the learner” as that is a big part of who I am as a teacher. Thanks everyone for coming out! I enjoyed talking with everyone. Keep making supplements! I was walking down the street yesterday in Umeda and I ran into a former co-worker of mine from ten years ago. (This happens a lot and I always say the Osaka is the biggest little town I’ve every lived in, but that’s another story). We were both in a hurry and had places to be, but pledged to get together and ‘catch-up’ sometime. I asked him if he was going to be at the JALT conference next weekend and his response was, “JALT? Why would I go to that?” His reaction got me thinking. I know that JALT has a bit of a PR problem, and I have some ideas about how to fix that, but I’ll leave that for another post. Instead, I want to list some reasons that I think people should go to the JALT National Conference in Hamamatsu this coming weekend. Although often referred to as the ‘national conference’ it is in fact an international conference attracting speakers and participants from all over the world. This year all five of the plenary speakers are from abroad and it will be a great opportunity to see how Japan fits in with the rest of the world in the language teaching arena. There are typically between 1500 – 2000 people at the conference, so whatever your interests in language education are, you will be able to find like-minded people. Are you thinking about doing a research project? You can find people doing similar work. Are you looking for a job? There are people at JALT who are looking to hire someone. I’ve personally gotten a job from someone I met at the conference before, so yes, it does happen. All of the major ELT publishers in Japan are at the conference. Like it or not, publishers are a major part of our industry and a big part of any teachers job. The conference is a very convenient place to be able to meet with all of them and in my experience, they are more likely to give away samples, teachers guides, and other materials to people at JALT than at smaller events like the ETJ Expos. One of my favorite things to do is to drop in on a presentation on a topic that I’m unfamiliar with. I’d like to think that I’m fairly well read in my areas of expertise, but there are lots of things in language education that I know nothing about. I find it can be quite stimulating to learn about an area of language education that I’ve never thought about. There are lots of social events and other things besides presentations going on. It’s possible to stay completely busy by only going to parties. Additionally, one of the most interesting things for me is to see part of Japan that I’ve never seen before. Let’s be honest, Hamamatsu is probably not a place that is high on most people’s ‘places to visit’ list. I’ve been there before (in 1998) and I’m curious to see how much things have changed, or not as the case may be. Last weekend I was in Tokyo to attend the JALT College and University Educators (CUE) SIG Conference where I gave a presentation about an action research project I did a few years ago. I started the presentation by talking about my experiences as a novice teacher; specifically how my initial training and the policy of the first few schools I worked at was that teachers were not allowed to use the students’ L1 in the classroom. This continued while I was teaching at a pre-academic IEP while in graduate school in the United States. After I returned to Japan and started working in tertiary education, I quickly found out that I was expected to use Japanese outside of the classroom when dealing with the administration and other faculty. Therefore, I began a crash Japanese study program. As my Japanese improved I found that I was using Japanese more and more in the classroom and I was interacting less and less with the students in English. So I decided to undertake an action research project. I picked two low-level, first year English courses. In one course I spoke only English and in the other I spoke both Japanese and English. I kept a notebook where I jotted down my interactions with the students to keep track of how often the spoke with me in English or Japanese. I assumed that if the students knew that I was able to communicate with them in Japanese, then they would not try to talk with me in English. However, that wasn’t the case. In the bilingual class, my interactions with the students were a 50/50 mix of English and Japanese. In the monolingual class, less than a fifth of the students tried to communicate with me in English (less the bilingual class). The majority of students continued to try to speak with me in Japanese and a small percent of students refused to communicate with me at all. I was therefore able to determine that students were more likely to communicate with me if I spoke both English and Japanese. I ended the project by giving each class a survey. In the survey I asked if the students felt like they learned more English because of the language that I spoke. The bilingual class agreed that the learned more English because I spoke both English and Japanese. The monolingual class did not think that my only using English helped them learn. Next I asked the students if they were more motivated to speak with me in English because of the language I used. The bilingual class somewhat agreed and the monolingual class didn’t feel that my only using English motivated them to use English. Finally, I asked the monolingual class if the wanted a teacher who spoke both languages and they overwhelming agreed. I asked the bilingual class if they wanted a teacher who only spoke English and they overwhelmingly disagreed. I concluded the presentation by relating how I have changed my behavior. First, I set the policy that the primary language of the class is English and that students must first try to communicate with me in English, but that Japanese is allowed. Second, I make it a point of teaching classroom English so that students have the skills needed to communicate with me in English. Finally, whenever a student tries to communicate with me in Japanese I encourage them to use English.